No matter what industry you’re in or what product or service you provide, your customers have become more savvy and demanding in the past five years. Smart, educated, less loyal, and more connected than ever, if customers don’t get what they want from you, they’ll get it from your competition. The rise of social media and always-on Internet have put word-of-mouth and previously closely held trade secrets like margins and cost of goods into the hands of anyone with phone. Today, multiple, complexly interconnected touchpoints occur at every single point of interaction between you and your customers. And the velocity of change is staggering. Recognition of the critical nature of customer experience has been building over the last several years, and the slow build has finally hit a crescendo. Recent research indicates that 90% of executives state that customer experience is very important or critical to their firm’s strategy in 2010. They fully recognize that tracking and understanding customer experience is very important. But it’s difficult to do. In fact, half of all senior executives state that lack of measurement is a significant obstacle to improving customer experience. The explosive growth of customer relationship management (CRM) has created a multi-billion-dollar IT and consulting business focused on just this point. But these technologybased solutions can cause organizations to lose sight of the core issues that drive customer relationships. While adept at helping companies track interactions with customers, they do nothing to help companies understand—and improve—customer perceptions of these interactions. This is one set of issues senior executives simply cannot afford to misread or mismanage. In fact, in 2009, 86% of consumers stated they had stopped doing business with an organization after a bad customer experience, up 27% from four years ago. At this rate, it’ll only take one poor experience to lose any customer by the time 2015 rolls around. And in a world where the cost of acquiring customers is exceedingly high (acquiring a new customer can cost up to six to seven times more than retaining a current one), the price of poor experience delivery could shutter your doors. With this in mind, customer experience may be the most important way to grow your business today. So what can forward-looking companies do to deliver a differentiated customer experience in a world where customer expectations are changing as fast as touchpoints are multiplying? Re-evaluate how you touch, influence, and serve customers. As brand loyalty erodes and touchpoints multiply, staying ahead of changing customer expectations means that everywhere you interact with a customer, your “touches” must be smarter, faster, and better. Where moments of truth, touchpoints, and customer experience intersect. If a moment of truth is the opportunity for an organization to make an impression on a stakeholder, a touchpoint is the static, human, or interactive interaction that creates the impressions. These touchpoints create positive or negative impressions at any given moment of truth. The result? Customer experience, as perceived by the customer—the only perspective that counts. A mere five years from now, companies that don’t understand and control their touchpoints will be at risk as smarter, faster, stronger competitors deliver better customer experiences and steal their market share. Companies must immediately re-evaluate the ways they touch, influence, and serve customers. Five years from now, the majority of profitable customers will expect faster, better, and more customized experiences than most firms are able to offer today. Most companies, even those that recognize the importance of customer experience and the need to measure it and improve it, have little idea what their customer experience actually is. In fact, most companies don’t have a complete picture of existing customer interactions or touchpoints—even the ones they control. So where to start? First, identify the touchpoints you do have, and create a map of where you are today. Then leverage the insights to chart a path to where you need to go tomorrow. We call this exercise touchpoint mapping. With this data in hand, you have a roadmap for constructing a specific plan to move forward, a plan that helps set priorities, maps out costs and benefits, and provides specific metrics for measuring results. If customer experience is driven by the touchpoints customers encounter when they interact with your company, then lack of knowledge about these touchpoints means that you’re tacitly (if unconsciously) ceding control of your customer experience and, by extension, customer perceptions of your brand. 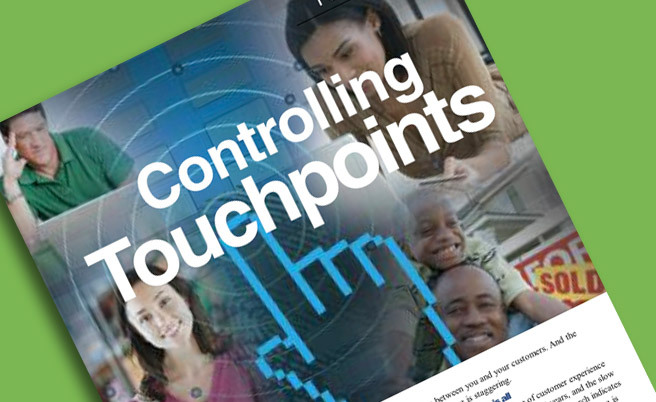 Will you control your touchpoints or allow them to control you? The importance of touchpoints—understanding which work and which don’t, controlling those you can, influencing those you cannot—will be the defining factor in delivering a better customer experience, building stronger relationships, and driving loyalty over the next five years and beyond. Michael Hinshaw is managing director of MCorp Consulting, (www.mcorpconsulting.com) a customer experience research, brand and strategy consultancy based in San Francisco, with offices in Vancouver and Charlotte. Michael has more than 20 years experience in customer experience innovation, marketing, and brand and management consulting. View his Touchpoint Insights Blog (www.touchpointinsights.com) or follow him on Twitter (www.twitter.com/michaelhinshaw). Touchpoint Mapping and Touchpoint Metrics are registered trademarks of MCorp Consulting, all rights reserved.